Our philosophy, Technology With Commitment, can be defined by one word: SUPPORT. We believe that every Customer should only have to be sold once. Our commitment to supporting each and every Customer like they are our only Customer helps make this a reality. When our Customers need a machine they don’t shop around, they just call us. Don’t believe us? Check out our Customer Testimonials. 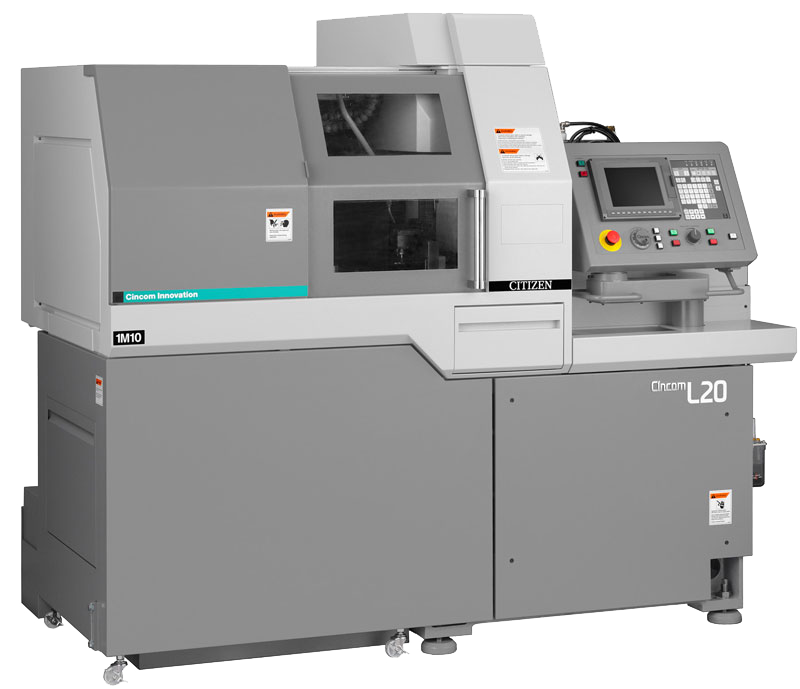 The A20 has been acclaimed by customers as a highly rigid, low-cost machine. 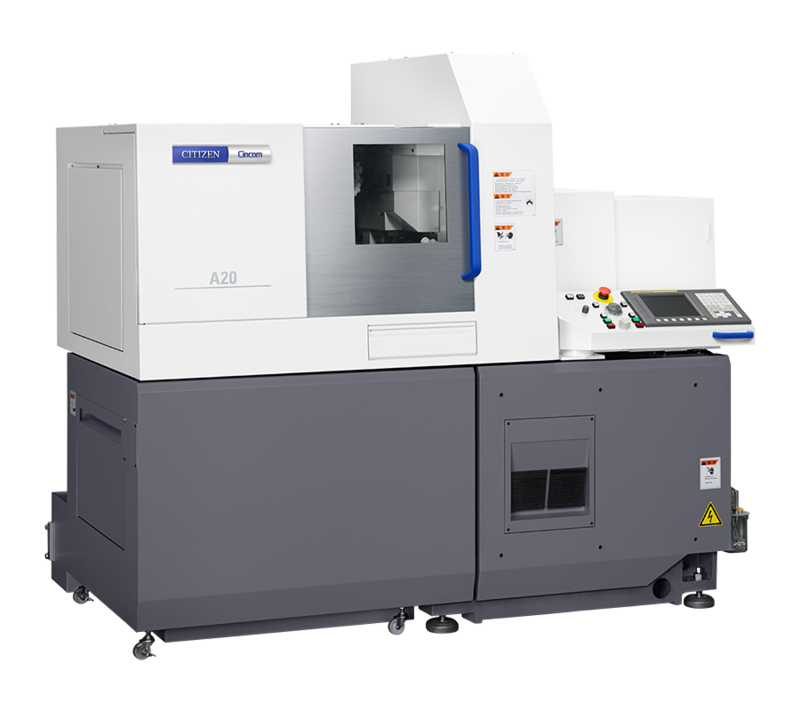 The A20 Type VII provides an X2 axis on the back spindle making front/back simultaneous machining possible. This, in combination with the fast 32m/min rapid feed rate, has substantially cut cycle times. With its Fanuc Series 32i-Model A System Control and five cutting axes (X, X2, Y, Z, Z2) the A20VII offers quick set-ups, high speed and low running costs. In addition, Cincom’s unique Streamline Control assures fast and smooth movements. The standard tool layout includes 5 turning tools, 4 rotary tools, 4 tools for front drilling and 8 tools for back drilling. 4 rotary cross-drilling / milling spindles and 5 turning tools fitted as standard for turning, grooving, screw-cutting, parting-off etc. Front: F7 - M5 (ER11). 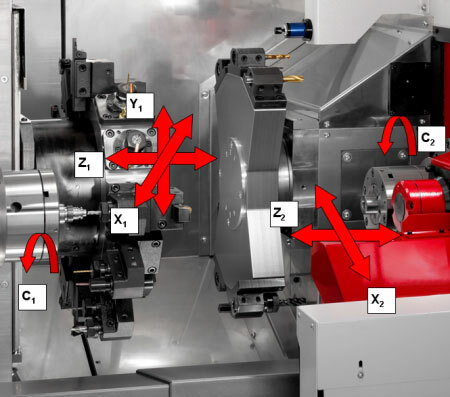 4 fixed stations for back machining. With A220-U151B option, all 4 can be utilized for either live or fixed end working (4,500RPM / 0.75kW). 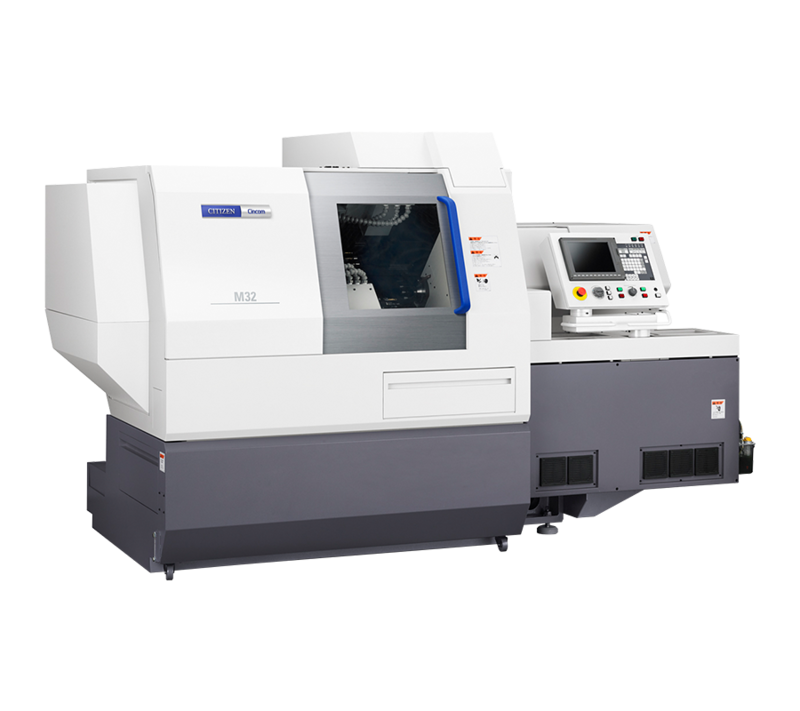 The CINCOM L20X further develops on the best-selling L20E-IX with additional tooling capacity and a Y axis on the front-machining toolpost. 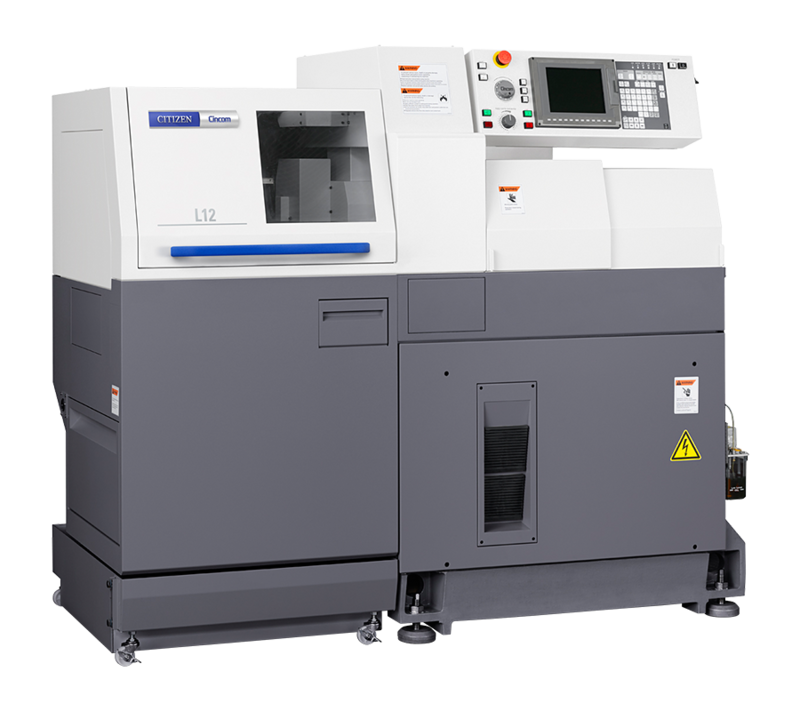 The L20X has been specially developed for high-precision manufacture of simple and complex parts in medium to large batch sizes. It offers all-round versatility and flexibility with its many options and extremely short setup times. Rotary tools rated at 1kW / 5,000RPM. Tooling arrangements allow extra cross rotary tools, extra turning tools or extra end-working rotary tools depending on your priorities. 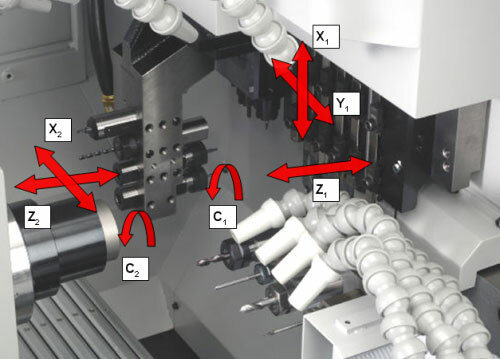 6 front-working positions as standard (up to 3 rotary tools, 0.75kW, 5,000RPM). 4 fixed back-working positions and 2 rotary GSE3507 as standard. More tools!... more functions!... more flexibility!...higher productivity!... same floor space! 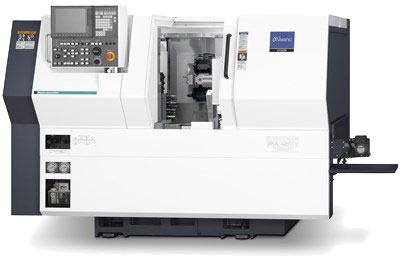 The M32 is renowned for its leading capability for 3 tool simultaneous machining in a compact floor space. The all round combination of flexible tooling, large tool capacity, and outstanding ease of use has made the M32 our success story in the new century. The next generation M32 increases the 3 tool simultaneous machining abilities with a new Y3 axis on the back tool post which carries up to 9 tools (up to 6 driven). New advanced functions include a B axis on the gang tool post with 4 axis simultaneous containing control. In addition the machine boasts an improved / upgraded turret with direct indexing, faster rapid feed rate (up to 32m/min) and reduced power consumption. 4 rotary cross-drilling / milling spindles and 5 turning tools for turning, grooving, screw-cutting, parting-off etc. 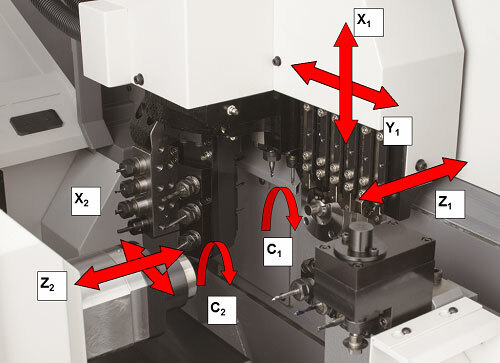 Rotary tools incorporating a B axis can continuously change the angle (-10° to +105°) for angled holes. 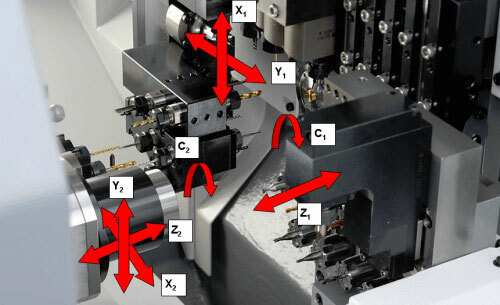 Contouring with simultaneous 4-axis control is also possible. 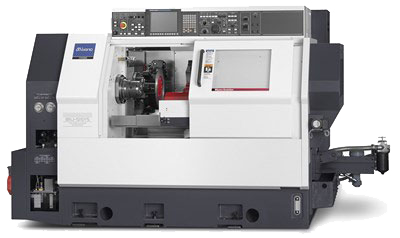 Allows Front and back machining including pinch milling. High-torque power driven tools available for all 10 stations (6,000RPM and 1.5 / 2.2kW). Multiple tool holders and intermediate indexing allow 60+ tools to be fitted. Tools can be indexed directly without turret retraction saving 0.5 secs per index. 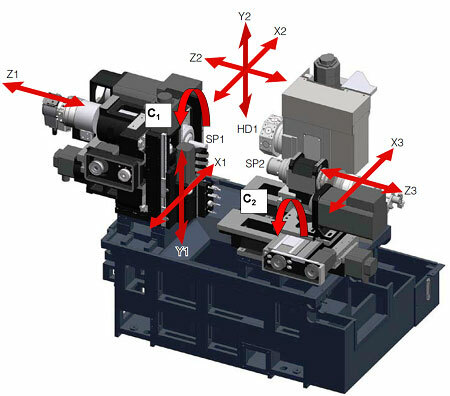 Y-Axis allows tool change without turret indexing and tool offset adjustment in 3 axes. Double / Triple sleeve tool holder and double cross-spindle take full advantage of Y-axis. Up to 9 tools can be fitted. Allows operations such as drilling (face / cross), tapping (face / cross), screw-cutting, boring, interpolation, PCD and turning to be carried out simultaneously with other operations. 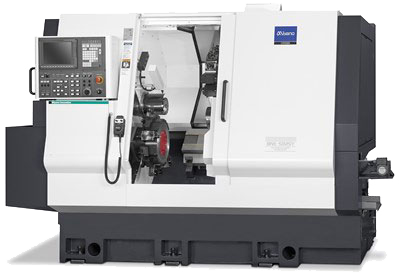 Featuring 2 spindles, Y-axis equipped turret and flexible gang toolslide, the BNA-42GTY offers excellent value with independent machining on the front and back of the workpiece simultaneously. 8 station turret with the half-position indexing mechanism utilizes all 16 turret stations with no turret tool holder interference. The 8 driven tool positions are individually powered (2.8 / 1.0kW, 6000rpm) to minimize torque loss and a lubricating system protects the gears inside the turret. 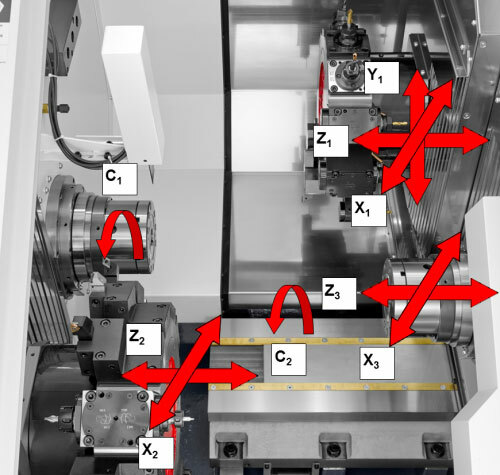 Featuring Y axis to enable maximum machining flexibility. A flexible package of fixed and driven tooling is available. The 12 driven tool positions are individually powered (2.5kW, 6000rpm) to minimize torque loss. Y axis as standard allows more complex parts with driven tools. 6 station turret for back working. Allows work to be carried out simultaneously on sub spindle whilst main turret works in main spindle. Solid construction with no axis movement. 2 x 12 station turrets. The 12 driven tool positions are individually powered (2.2kW, 6000rpm) to minimize torque loss. Y axis as standard on upper turret allows more complex parts with driven tools. High speed 15,000RPM main spindle with 3.7kW motor - sub spindle 10,000RPM \ 0.75kW.